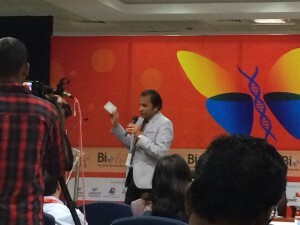 The Rapid Diagnostics Conference at the BioAsia 2015 Convention was inaugurated by Dr V Lakshmi, the Head of Department of Microbiology at the prestigious Nizams Institute of Medical Sciences, in Hyderabad, India. 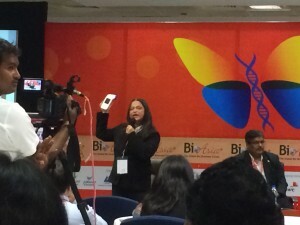 In her inaugural speech, she touched upon the evolution of diagnostic technologies and the trends in the industry favoring rapid diagnostics, a technology that potentially involves components such as Nanotechnology, BioMEMS (biomedical microelectromechanical systems), microfluidics, Lab-on-a-chip and RT-PCR (Reverse transcriptase polymerase chain reaction). This speech was followed up by four presentations by companies in this vertical. Dr Vijay Mathur, who heads the R&D of Diasys Technologies spoke about the low cost cartridge based Point of Care Testing (POCT) technology that their company has developed. They currently hold about ten patents and have recently acquired the diagnostics business of Piramal Healthcare, a pharmaceutical company in India. It is so disruptive that the results of the test are out in three minutes flat. They have a Q3 2015 launch plan, with an aggressive pricing strategy, the device costs less than $800. Sadhana Seth from Siemens Healthcare discussed how Siemens was uniquely positioned as pioneers and market leaders in the space, followed by how they have managed to capture the market leading position by partnering with major hospitals in India. She also launched the handheld coagulation device that gives results in under two minutes. They also have a strong informatics backing to help care providers deliver care in the most effective way possible, by minimizing redundancies and closing loops whenever possible. This was followed up by an interesting session presented by Dr. Ravi Vinayak, VP of Sales and Business Development of BioMed Diagnostics, which makes diagnostic kits for microbiology applications. Their customers include the likes of Quest Diagnostics. A simple solution called InTray, that potentially replaces petri dishes was showcased at the conference. Their solution for liquid media is called InPouch. The last presenter was Dr Sumit Mitra whose company MolBio, specializes in developing rapid diagnostics for communicable diseases. Their solution for detecting, Bacillus tuberculosis, a bacterium (that casues TB) and Trichomonas vaginalis, a common STD causing pathogen have received accolades in the industry. The session concluded with a discussion on the regulatory oversight of POCT technology in India. The speakers, Dr Walia (Indian Council for Medical Research) and Dr Kumar (CEO of RAS Lifesciences) spoke about the industry, national and international perspectives of Rapid Diagnostic Assays.